Owen Campbell holds himself apart from other people. Badly scarred from emotional wounds that have never healed, he doesn’t expect to find true love or happiness. He remains isolated in a prison of his own making, determined to not let anyone close enough to hurt him again. But his willpower is shaken to the core when Sarah Browning enters his world. Sarah Jane Browning is three years into her college degree when a call from home changes everything. Back at the family homestead in the heart of Appalachia, she’s forced to reevaluate her hopes and dreams for the future. Distraction from her heartache comes in the form of her parents’ neighbor. Whispers about “odd Owen Campbell” abound in their small community, and Sarah’s curiosity is aroused. When she breaks the rules and trespasses onto his land, what she finds is beyond her wildest imaginings. As Sarah struggles to overcome tragedy and loss, her burgeoning relationship with Owen is sorely tested. Will love conquer all, or will the secrets from Owen’s past tear them apart forever? The cover of this book is *gorgeous. * I thought the image was so magical and romantic, I needed to find out if the story matched. I wish I had this in paperback, along with the other two books in the series - Butterfly Lane and Dragonfly Creek - just so that I can admire them on my book shelf from time to time. This book was unexpected in a lot of ways, and I don't want to reveal too much here in my review. Simply put, there's a paranormal element to the story that I hadn't expected. It gives a nice flavour to the novel, particularly the way that everyone reacts to it. The book is set in the late 1950s, and it's very much styled that way. There's a 'small town, slow paced' way about Firefly Hollow that is entirely appropriate for the story - but that unfortunately was too slow for me. I had trouble getting through the book only because there was so much time spent mulling over the various problems facing Sarah and Owen. I think partially I expected more... magic? Not in a paranormal sense but in terms of something sparking in me as I read the story. I couldn't get that connection going, and I was frustrated by that. As a romanticized throwback to the period, I think it works really well. I liked seeing how some of the conventions of the period affected the romance between Sarah and Owen. ** I came back to this review after having a couple of days to think about it, and I want to be clear that while I still think there's a quaint, 'more innocent time' vibe going on with this book, there are events in the book that are quite disturbing - very, very disturbing. Glossing over that would sell the book short and not prepare other readers. As an aside, I often wonder about these long-term immortal relationships and what they look like as they experience these differences in society. Modern conventions are so different (in some ways, and not so different in others), that I wonder how these relationships coped with older/different notions about behaviour and propriety and such. Back to Firefly Hollow: I appreciated some of the really frank conversation, particularly between Sarah and her mother, Eliza. I thought Eliza was a delight with her open, honest mothering. I defy you not to want to give her a big hug by the end of the book. This is a sweet story about a couple who are drawn to each other while facing various personal issues. I had a hard time connecting with it, but I think it is a well written story. There's lots to like here - primarily in atmosphere and overall tone. I just wanted something... more. That elusive something. 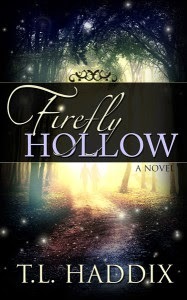 I'm going to rate *my* experience with Firefly Hollow a 3.5/5 stars, but I would really love to hear from other readers, to see how your experience with the book compares. Did you find that spark? For fans of sweet romances, heroines who have a sweet innocence about them, light paranormal romances.